This article provides information on how to start working with the Capacitive Touch Display 7 Inch Parallel, which includes how to set up the hardware (wiring), install and configure the necessary drivers for a touch demo. This topic provides pin connection details in regards to connecting the Capacitive Touch Display 7 Inch Parallel to any of our carrier boards. 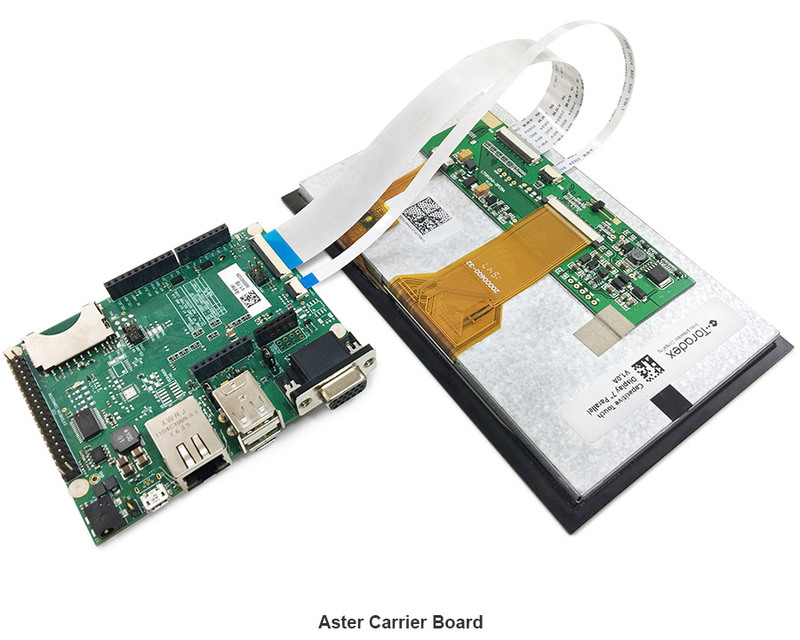 Please refer to the below images for connecting the display to our Ixora Carrier Board (V1.1 and above, for V1.0 the Capacitive Touch Adapter is needed) & Aster Carrier Board. At present these carrier boards support a Capacitive Touch Interface Connector with our Capacitive Touch Display 7 Inch Parallel. 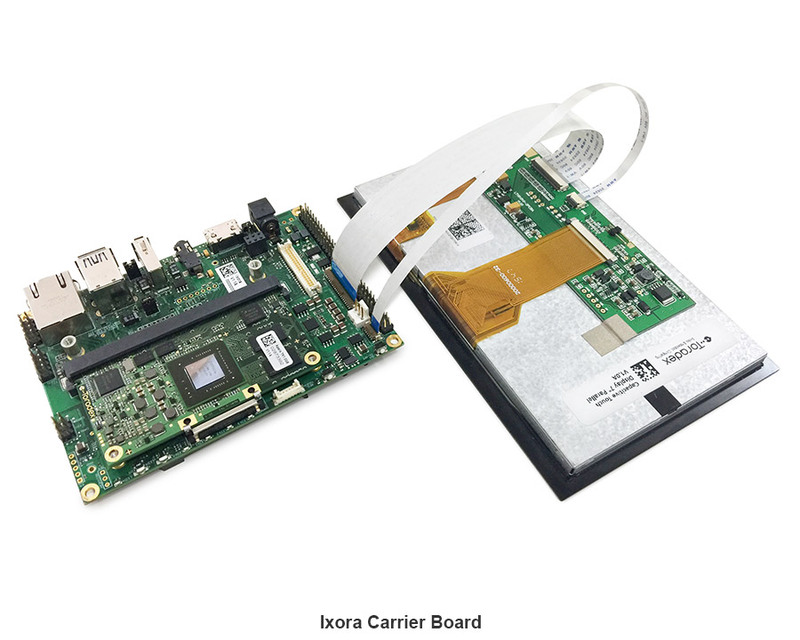 For other carrier boards or evaluation boards like Iris, Viola, Colibri Evaluation Board, Apalis Evaluation Board, one can use the Capacitive Touch Adapter as the capacitive touch connector not yet available. All connection details are available in the Capacitive Touch Adapter datasheet. The installer can be installed on WinCE6 PXA modules. The Hwadapt application doesn't support PXAs. It would need porting to the legacy library to make it work for PXA. Please refer to the Capacitive Multi-Touch Solution Source Code for more information about the Hwadapt application. The display should show the Windows CE desktop without any border, flicker, etc. Click here for more details including, checking the documents for general functionality, multi-touch hardware adaption application. For IMX7 Modules: Use WinCE image v1.0 or newer images. Install Touch driver, Run Display tool V1.0, Click ConfigSave, Set UseSplashSettings and Click RegSave. Close the Display tool and Reboot. In case of any issue with reset or interrupt lines, use GPIO Config Tool to monitor and control reset & interrupt pins (SODIMM or MXM3 pin). Please check if the reset pin is in its inactive state (level is 1) so that the touch controller of the display can run. To configure the correct display resolution set the vidargs environment variable according to your module as described below. For more information refer to the Display Output, Resolution and Timings article. Due to wiring differences, this needs further device tree customizations. For compatibility across carrier board/s PWM_B/PWM_C pins are used as pen-down and reset interrupt, so the PWM functionality on these pins has to be disabled and the relevant GPIO functionality enabled and assigned to the touch driver. On Vybrid based devices the two PWM instances, PWM_B/PWM_C need to be disabled in the device tree. There are two ways to do this. See also Device Tree Customization. Warning: Make sure that the variable fdt_file is with the correct device tree for your carrier board. On i.MX6 based devices the two PWM instances need to be disabled in the device tree. There are two ways to do this. -       * property or disable weim node. Donwload the Embedded Linux image, unpack the files and flash the DTB file. The commands below are using an example of an image, check the correct latest download link for you module on Linux Image Downloads. On i.MX6ULL based devices the two PWM instances need to be disabled in the device tree. There are two ways to do this. On i.MX7 based devices the two PWM instances, PWM_B/PWM_C need to be disabled in the device tree. There are two ways to do this. Starting with release 2.7b4 touch controller will be automatically detected and the kernel module loaded, no changes are necessary. The preprocessor macro USE_CAPACITIVE_TOUCH_ADAPTER has to be defined in the board file. The brightness value can be any integer in the <1,255> range, where 1 => brightest, 255=> darkest. Note: The following instructions were tested on BSP 2.8b2. On Apalis iMX6 based devices the atmel_mxt_ts@4a need to be enabled in the device tree. This module does not provide the RGB interface required for the screen to work, therefore touch support was not enabled.